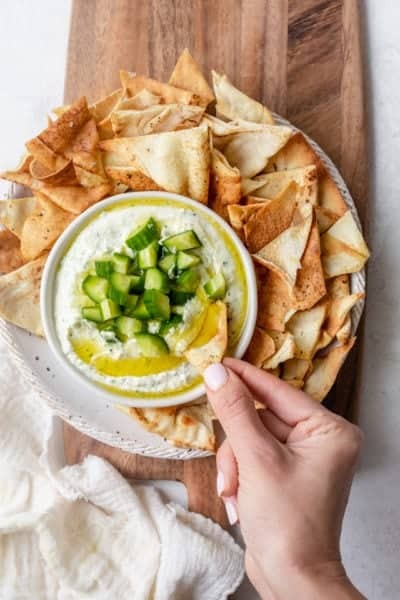 This Creamy Feta Dip is a simple crowd pleasing Mediterranean inspired appetizer and healthy snack that is very easy to prepare for parties and potlucks! Confession: I’m not really into the Super Bowl. But I’m totally into the food that comes with the Super Bowl, and I like the commercials too haha. 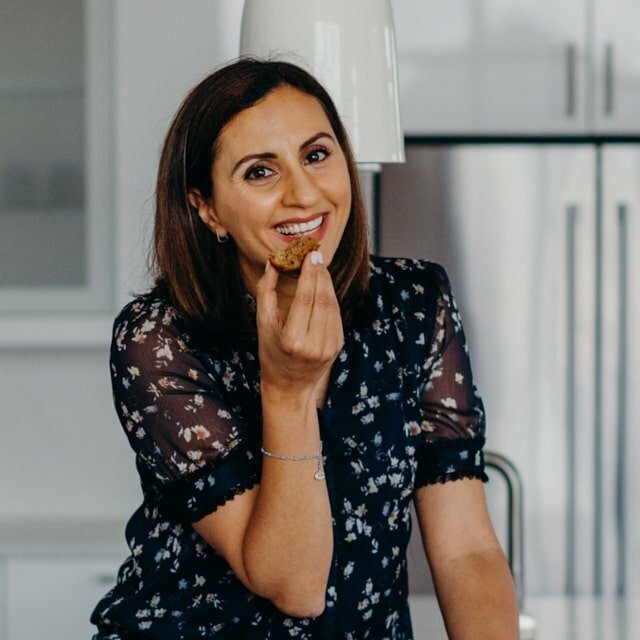 While the game (in between commercials) is on is usually when I take my bathroom breaks or chit chat about the recipes I made that day. 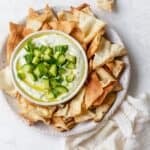 For Super Bowl this year, I’m throwing in a lighter type of dip to the mix – this Mediterranean inspired creamy feta dip! Feta Cheese: This is the most important ingredient. Traditionally sheep’s milk feta is the mostly widely used in Greece. But you can really use any kind you like, in a block or crumbled. Greek Yogurt: This will make it creamier without having to add mayonnaise or cream cheese or milk. Olive Oil: We’ll be whipping the feta with it and also drizzling it on top to serve. 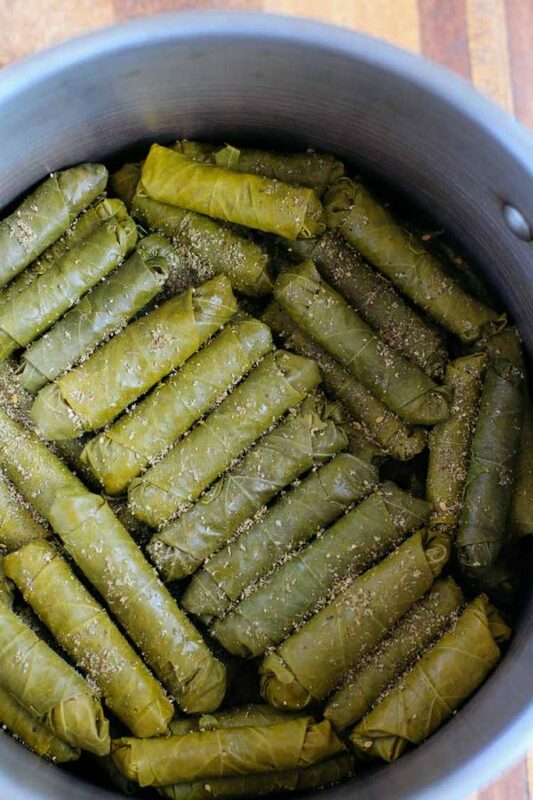 Use extra virgin olive oil if possible for best flavor. Lemon Juice: This gives it the freshness and helps to emulsify the mixture when whipped with the olive oil. Garlic: You can leave this out, but it’s only one clove and it adds a great amount of flavor to the feta dip. Just make sure you squeeze it or mince really well so it blends more easily without any chunks. Mint: I like mixing in some fresh herbs into the dip and throwing some on top to serve. Mint is just optional. You can switch it up with dill or parsley. To make the dip, just throw everything in a large bowl and use a fork or spoon to mix it all together. The texture will be grainy and a little chunky since we’re not using any cream cheese or mayonnaise, and also since we’re not blending it in a food processor. But that’s exactly what you’re looking for. 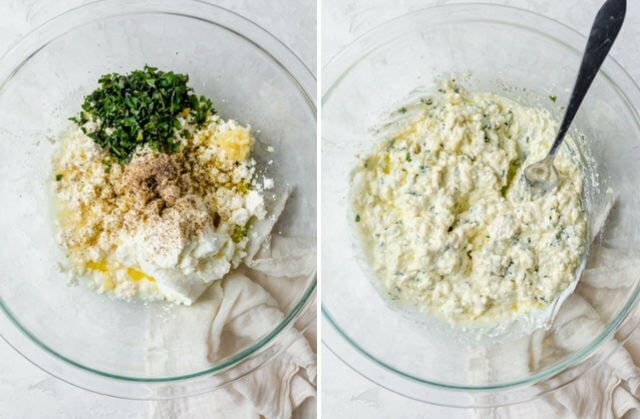 So once you break up all the feta and blend everything well, transfer it to a smaller serving bowl and chill until you’re ready to serve the feta dip. I label this snack as a dip, but it can be so much more than that! I love how fresh and light the flavors are, and how versatile the recipe is overall to go beyond just being a dip. 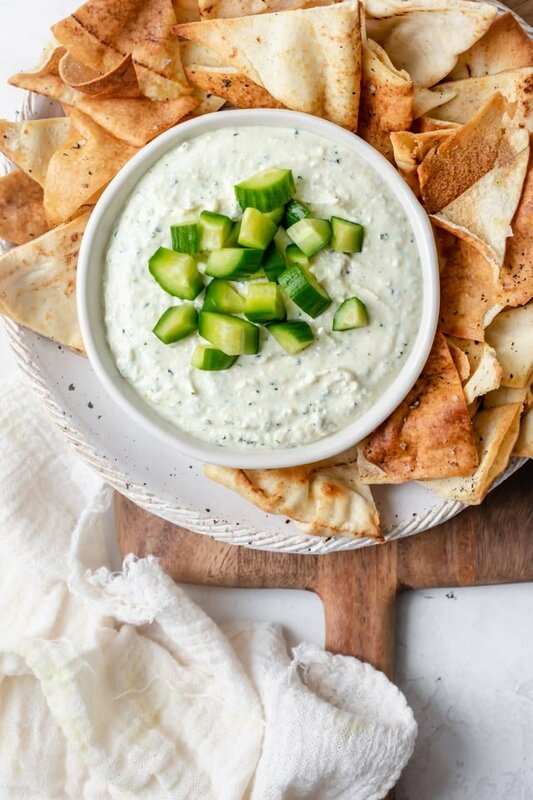 As a dip, this recipe works best with toasted pita chips. That’s the way I usually serve it. But it’s also wonderful with pretzels, crackers, toasted baguette slices, breadsticks and vegetables, like carrots and cucumbers. It spreads quite nicely too, so it works really well in sandwiches like my beef shawarma wrap or my roasted cauliflower pita sandwiches. This feta dip also pairs really well with a salad. It’s similar to the idea of adding hummus to your salad. 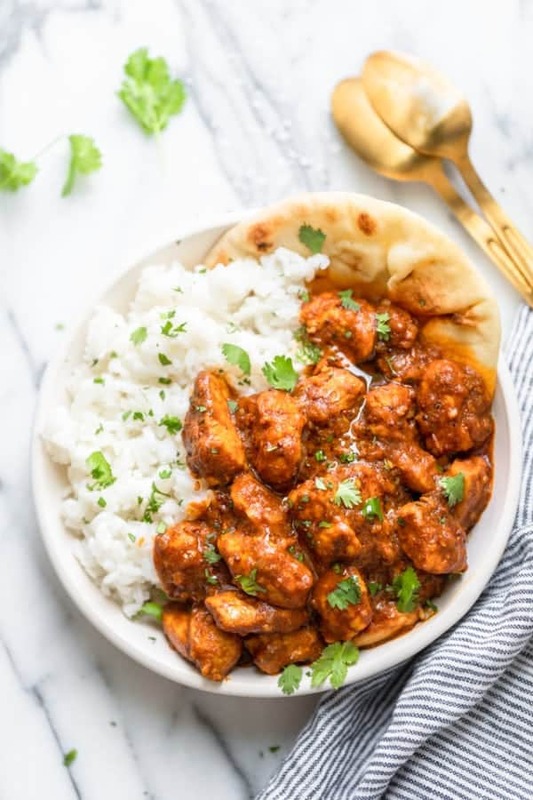 It adds lot of flavor and protein. If you want to pair it with some salads, try my Mediterranean Pasta Salad or my Green Goddess Salad. This dip literally takes a few minutes to assemble, and it makes for an awesome snack for Super Bowl or any other parties or potlucks. Everyone loves the refreshing, light and creamy flavor of the dip. 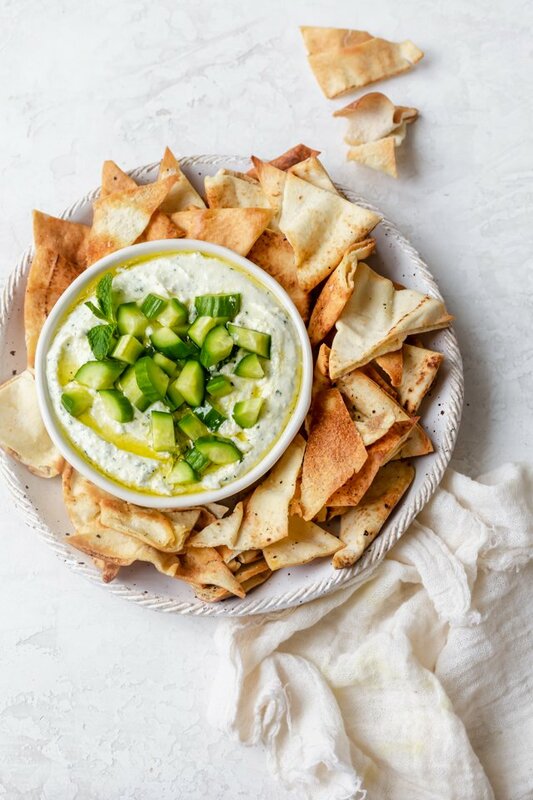 If you have feta fans, you’ll definitely have feta dip fans! 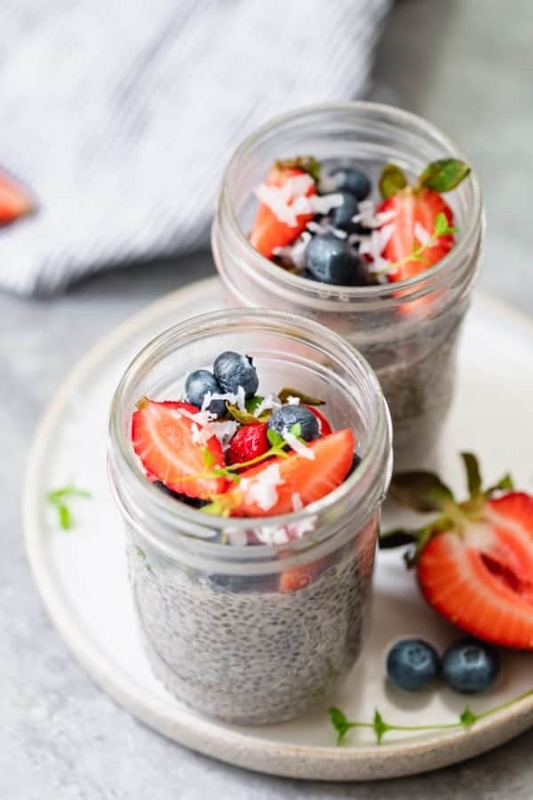 It’s made with pretty healthy ingredients, loaded with protein and comes out super delicious. Everyone agrees it’s pretty irresistible! If you’re looking for new ideas to bring to a party this weekend, this one is a breeze. It won’t take you much time to whip it up, and it pairs well with just about any of your favorite dippers or possibly just even a spoon haha! If you’ve tried this healthy-ish feel good Creamy Feta Dip recipe or any other recipe on FeelGoodFoodie, then don’t forget to rate the recipe and leave me a comment below! I would love to hear about your experience making it. And if you snapped some shots of it, share it with me on Instagram so I can repost on my stories! 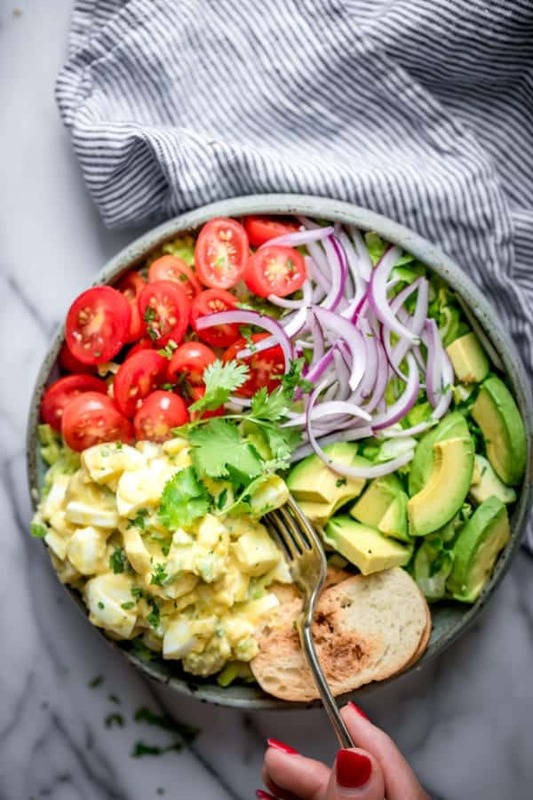 Place the feta cheese, Greek Yogurt, olive oil, lemon juice, garlic, black pepper and mint in a large bowl. 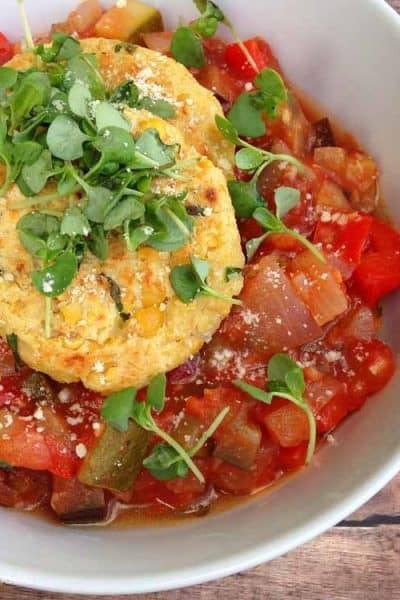 Whisk the ingredients together until well blended without any chunks of feta leftover. Transfer the dip to a small bowl, cover and store in the fridge for up to one week. When ready to serve, drizzle with olive oil, fresh mint leaves and diced cucumber. Serve with toasted pita bread, if desired. Storage: Store any leftovers in an airtight container. The dip will last in the fridge for up to one week. Make Ahead Tips: You can make the dip up to 3 days ahead of time and store it in the fridge in an airtight container. Note that it will stiffen in the fridge, but will loosen once left at room temperature for half an hour. Substitutes: For best results, follow the recipe as is. However if you prefer to skip the garlic and mint, you can do so. 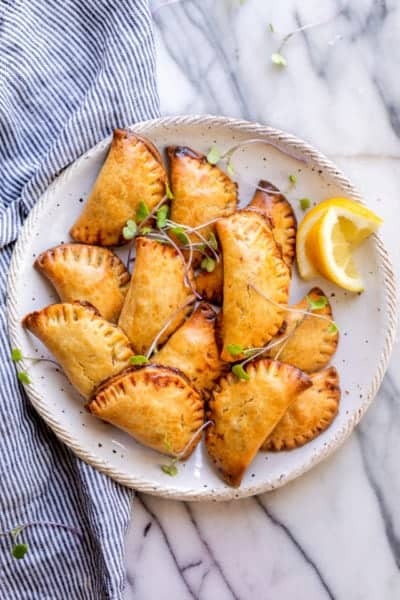 They really help flavor the recipe though so I would strongly recommend using them, and especially recommend using them fresh instead of in powdered/dried herb form. Equipment: You can whip up this feta dip simply by using a fork or spoon. If you want it to be extra creamy and whipped, you can try using a small food processor. I tried mine in the Cuisinart Smart Stick, which is like a mini food processor and perfect for quickly blending small dips like this. Love snacks. Not only is this dip light & yummy, but versatile and easy to prepare as well.